Since the title of this blog is Knucklehead Theology, you are probably wondering why so little has been said about Knuckleheads so far. Not to worry, having owned and ridden Knuckleheads for over 25 years, and drag raced them for about 15, there is plenty to come. Today I would like to talk a little bit about Knucklehead cylinders. We have all heard the horror stories of broken Knuck cylinders. And it is my guess that there are nearly as many theories as to why they break, as there are those stories. I am not going to claim to have the definitive answer, only theories of my own. This is one that I would love to have comments from others with their own thoughts. The first time I saw a knuckle cylinder break, was while attending Motor Cycle Mechanics school at Hutchinson Area Vocational Technical Institute in about 1979. One of the other students (a Triumph guy) had brought in a Knuck chopper to work on for a friend of his. The engine that he had was a 61", but it had cylinders that were bored out to 74" plus. I don't recall exactly how much plus they were, but it would not surprise me if they were +.060 or +.070. Don't know if it was the owner's idea, the student's idea, or the instructor's idea, but someone's solution was to shave material off the base gasket surface to get the pistons closer to the top. I winch just thinking about it now. One wrinkle was that before the engine was assembled, another student bought the bike! The results were predictable. After the new owner finished assembling the engine, during initial start up, one backfire while kicking broke the cylinder off at the base! As a side note, the new owner bought a set of used 61" cylinders which were also at a 74" bore. 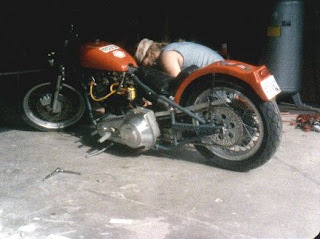 He rode the bike for one season, and then sold me the knuckle engine when he bought a new "crate" Shovelhead motor. I ran that engine for many years and many, many miles with that ultra low compression. The next time I had occasion to see an "exploded" knuckle cylinder, was a case of being in the right place at the right time. I happened to pull up to a stoplight behind another knucklehead. As the rider attempted to pull away in a quite normal manner, his front cylinder lifted. Of course I pulled over to see if I could lend a hand. This was in about the mid 1980s, so my memory is less than clear, but I do believe that the part of the piston which unfortunately was now in full view, was badly scored. It should be obvious by now that all but the first incident that I related had one thing in common (at least if my memory serves me). That, of course is that in each case the broken cylinder was accompanied by a scored piston. As far as I know, they all shared one other thing in common; a large overbore on the cylinders. Somewhere along the line a customer brought me a set of +.060 Knuckle cylinders to check for him. Looking at the bore I found something quite interesting. The bore had actually turned blue between the fins. Honestly, you could see where the fins were from the inside because the spaces between them was blue! For years after this I avoided boring Knuckle cylinders more than +.050. I just knew that if the cylinders were thin enough to turn blue like that, they had to be on the verge of exploding. I am not so sure anymore. Over the years I have had the pistons score badly on my wife's 61" Knuckle numerous times, for numerous reasons. At least one set can be chalked up to the manufacturer. I saved the little instruction sheet that came with the pistons which called for .001 clearance. A couple more sets of identical pistons gave similar results. Then another set of identical pistons came with a similar little instruction sheet which called for .003 clearance. Oops! Another set went because we went for a weekend trip with a group of friends when the engine was fresh, the weather hot, and the speeds excessive. Another I attribute to a burned out head gasket sucking air. Well, you get the idea. But no matter how many pistons we scored with that 61", the thick cylinders held up fine. Maybe I should point something out here. When I speak of a "scored" piston in a Harley, it is in reality a piston that has seized. The reason that in most cases the engine does not stop, is because of the extreme weight of the Harley flywheels. If pistons "scored" like this in any other motorcycle engine the motor would be stuck tight. Understanding that this piston scoring phenomena is actually a piston seizing phenomena should really shed some light on the broken knuckle cylinder issue. Add to this, some anecdotal evidence from my 74" Knucklehead. I have run it for many years at +.050. I never was willing to bore to +.060 for the above mentioned reasons. Each time I have had it apart, I have honed it to bring it back to straight and round. I think that the last time I put it together it was with about .008 clearance on a set of high compression cast pistons. Never a bit of problem, and I run it very hard! Are the "cheap" reproduction cylinders prone to breaking too? I really don't know. Some would say that they are. Part of the problem is that most of the information we have will be anecdotal (I can't believe that I am actually going to use that word twice in one day). Since a failure like this tends to be catastrophic, most who experience it once will be leery of taking any chances of it happening again. My guess is that if you had a +.070 break on you once, you would be sure to replace it with one as close to standard as possible rather than making some adjustment and using another +.070. Well, it looks as though I am going to have to make this into two posts. In the second half I will offer my thoughts and attempt to offer some solutions. In the mean time, I would love to hear from any of you who have had Knuck cylinders break, and the circumstances. In my last post under the label Theology , I wrote a piece called First, the Bad News , concerning the necessity of understanding the bad news of scripture, before you will be able to appreciate the good news (gospel). Unfortunately, just a realization of the bad news, that you are a dirty rotten sinner (just like me) is not the whole story. The "little more bad news" is, of course neither little in the amount that it is news or in the amount that it is bad. It is both big news, and very bad news. The "little more bad news" is that there is a penalty for breaking the Law of God. Just as our earthly governments set forth penalties for wrongdoing, so the Almighty God also has set forth penalties for breaking his commandments. A big difference is that here in this world we often "get away with" breaking laws. Often we can break the law without anyone ever knowing. Often we are not caught "red handed" and so are given the benefit of the doubt. Often the full penalty of the law is not brought to bear on us, because we are deemed to be a first time offender, or because there are extenuating circumstances. Not so when it comes to Jehovah's laws though. He sees all of our sins, and knows all of our sins. You are not able to slip anything past God. Even your sins that no other person on earth know about. Psalm 139:1-4 says "O lord, thou hast searched me, and known me. Thou knowest my downsitting and mine uprising, thou understandest my thought afar off. Thou compassest my path and my lying down, and art acquainted with all my ways. For there is not a word in my tongue, but, lo, O LORD, thou knowest it altogether." Each of us has been caught red handed by God! And God, being a totally righteous judge will hand down a perfect judgement. Every sin, every transgression of his law will be punished as it deserves. And there is a judgement coming! 2 Peter 2:9 proclaims "The Lord knoweth how to deliver the godly out of temptations, and to reserve the unjust unto the day of judgment to be punished:"
What is this day of judgement all about? The book of Revelation gives us a pretty good description of what will happen. Revelation 20:11-15 says: "And I saw a great white throne, and him that sat on it, from whose face the earth and the heaven fled away; and there was found no place for them. And I saw the dead, small and great, stand before God; and the books were opened: and another book was opened, which is the book of life: and the dead were judged out of those things which were written in the books, according to their works. And the sea gave up the dead which were in it; and death and hell delivered up the dead which were in them: and they were judged every man according to their works. And death and hell were cast into the lake of fire. This is the second death. And whosoever was not found written in the book of life was cast into the lake of fire." Does God "grade on the curve"? Can a man's good deeds outweigh his bad, thus allowing him to escape paying the penalty for his sins? Not according to James 2: 10 "For whosoever shall keep the whole law, and yet offend in one point, he is guilty of all." Guilty of all! A just judge will not allow the guilty to go free. Just as we speak of paying a "debt to society", so must the sinner pay a debt to God. No, this is the "little more bad news"; All of our sins must be payed for in full. Every last one of them. Bad news and more bad news! But if all of this bad news is causing you to despair, then maybe you really are ready for the good news. I know that I am anxious to get to the good news, and will in my next post on this subject. Three races; three class wins and two national records. Not a bad start for a couple guys who only started out to go to one race to see how they measured up. So why would they be thinking about making their bike faster? I guess that just comes down to the basic reason anyone is involved in any kind of racing. With only the National Finals left in the season, I suppose it was only natural for Bobby and I to try something to go really fast at the last race. Bobby was the ideal partner in this respect. No sooner had we discussed the possibility of more modifications, than he was on the phone researching it. I am not sure who he called first, but I suspect it was Jim Leineweber. He gave us some specs for distance between the valves while they were on their seats to see which of his larger cams would fit. Jim was probably also the one who suggested higher compression pistons. Lacing up a wider rim to spread the rear tire out and get more rubber on the pavement we figured out ourselves. A call to Axtell Sales down in Des Moines got us a set of higher compression pistons for the Shovelhead stroker. I wish I could remember with any certainty what compression ratio they where supposed to be. They may have been 12:1. That doesn't sound quite so radical in today's world of efficient combustion chambers, but at a time when the most common modification to a Shovelhead was to put in low compression pistons (7.2:1) it was enough to really get your blood pumping just thinking about it! And beautifully machined forged pistons they were. You could almost feel the horsepower just holding them in your hands! The cam that we settled on was a Leineweber L5. More lift, more duration, even more power! This was a much more serious race for us than the previous ones had been, so once the parts were in, Bobby sacrificed a couple weeks of riding on the street so that I could get his motor ready. But first, I tackled lacing the new wider aluminum rim to the rear hub of the drag bike. Again , Bobby had come through by calling around until he found a suitable rim. A wide 18" rim was almost unknown in the Harley world back then, at least in our little corner of the universe. Normally a simple job, lacing this rim was a little more challenging since it came with 40 dimples, but no spoke holes drilled. Nothing my handy Black and Decker 3/8 inch electric drill couldn't handle though; that and a good eyeball that is. With a week to go before we left for the finals in North Carolina, I got the bike finished. The motor was out of Bobby's Low Rider, new cam and high compression pistons installed, and back into the rigid frame. I think in was a Friday evening when I had it ready to fire up. I pushed it out of my garage, and fired it up. By the next Friday night we planned to be on the east coast ready to race, so I didn't see any point in babying the new parts. I revved the motor....maybe even a little more than my judgement told me I should. The engine sounded strong, but almost immediately it came to a sudden grinding halt. What had I done?!? I felt like someone had punched me in the stomach. Obviously something had gone terribly wrong. Was it from my over revving? Had I made a mistake when I assembled the motor? What now? So off came the heads again. The valves in one head were a mess; one broken off and the other bent and folded over; the piston far beyond salvage. All of the damage was in one cylinder, but it sure didn't look as if we would be going to the finals! As I took the engine apart, it became clear that the initial source of the damage was not the valves hitting the piston, or even the valves hitting each other. To this day I am not exactly sure what the cause was. If I had not revved the motor so high, would that have just delayed the "incident" until Bobby was on the strip? My first instinct was to throw in the towel, but after talking it over with Bobby we decided to at least see if it might be possible to fix the motor in time. Our Matco Tools dealer, who had helped us out with some cash before the Iowa race in exchange for putting his sticker on the bike, offered to pay for a new piston if we wanted to try to fix it in time for the finals. That was enough to seal the deal. We got another piston coming, a couple of valves, and found someone who was willing to replace the damaged valve seat for us on short notice. Time was running out, but it looked as though it might all come together for us. As soon as I got the head back from having the new seat installed, I did a standard 3 angle valve job on it. In retrospect, I hate to think how much flow we lost from that, but hey, sometimes ignorance is bliss! Our original plan was to leave right after work on Thursday night, but now I would be re-assembling the top end right after work. The modified plan was to be loaded up and to leave from our house as soon as the bike was ready. I decided that it would be best to actually hear the engine run before we loaded it up, just in case I had neglected something. The last thing I wanted to do was to get to the east coast and find I had left a critical part in my garage in Minnesota. As the clock neared midnight, I tightened the last few bolts, and a couple of kicks later the engine was running. We probably didn't let it run for more than 10 seconds before I shut if off and we loadeded the bike up. Against all odds we were on our way to the HDRA National Finals in Farmington North Carolina!